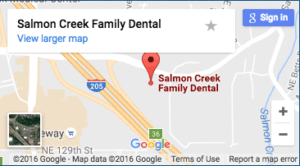 Welcome to Salmon Creek Family Dental, your dentist in Vancouver WA, and the general dentistry practice of Dale Nelson, DMD, where we pride ourselves on providing the most advanced general dental care to our patients in a friendly, comfortable atmosphere. We are happily accepting new patients. Salmon Creek Family Dental offers complete general and cosmetic dentistry services, ranging from porcelain veneers to dental implants, crowns, bridges, dentures, and tooth-colored composite restorations. If you are looking for a general dentist in Vancouver WA, or the surrounding areas, our professional staff is sincerely committed to providing you with the highest quality of care, using the most advanced techniques and personalized treatments, in a comfortable and pleasant environment. Salmon Creek Family Dental also features CEREC Restoration technology allows Dr.Nelson to create customized restorations without a wait! ...with Dr. Nelson when they schedule a paid cleaning. Our first choice for all dental work! “Dr. Nelson is our first choice for all dental work. They view us as PEOPLE, not numbers. No pain …. EVER"
“I am very thankful for Dr. Nelson and his entire staff for their excellent service, friendly atmosphere and ability to continue getting me in for earlier appointments. I have been a patient of Dr. Nelson for 10 years now and will always make sure to go out of my in the future for their services. Keep up the good work guys! He is professional and personal. As an experienced Salmon Creek dentist , Dr. Nelson understands the importance of a healthy and fully functional set of teeth. Patients who need dental crowns, inlays, onlays and other cosmetic dental treatments shouldn’t need to make several visits to our Vancouver dental office before they can enjoy the benefits of a restored smile. With CEREC Restorations, patients no longer have to wait to receive the smile they deserve. CEREC Restoration technology allows Dr Nelson to create customized, durable, tooth-colored ceramic restorations from the convenience of our Vancouver dental office, usually within a single appointment. With same day dental restorations, temporary replacements and second visits are no longer required. You’ll enjoy the immediate benefits of a beautiful, fully functional smile. During just one office visit, Dr. Nelson can diagnose and prepare your damaged tooth, create an optical impression of the tooth, and use CEREC to design and create a precision restoration that is then permanently bonded to your tooth. No stress, no discomfort, and most importantly, no wait! Don’t wait to get the smile you’ve always wanted. Schedule a CEREC Dental Restoration consultation with Dr. Nelson today! At Salmon Creek Family Dental, we offer CareCredit for patients without insurance. CareCredit offers interest-free financing for qualified patients, so you can receive the dental care you deserve. Call our office to find out more about CareCredit and schedule your dental appointment with Vancouver dentist Dr. Dale Nelson today! Serving Salmon Creek and Vancouver, Washington. We are conveniently located in Vancouver, Washington's Salmon Creek community, at 2515 NE 134th St Ste 200, Vancouver, WA 98686. Have dental insurance but need a new dentist?